Aplia Econ Blog: News for Economics Students: Would You Rather Receive $250 or an iPod? Telling everyone else how to rationally allocate their money is a pastime enjoyed by economists and non-economists alike. The holiday season, though, always seems to bring about the same piece of advice from economists: give cash, not stuff. The argument is compelling, at least theoretically. Which would you rather receive as a gift--$250 or an iPod costing $250? If you got the cash, you could always buy the iPod, or you could buy something you liked better. Therefore, the cash must be at least as good as the iPod. Therefore, the cash must be a better gift; QED. So why do people give gifts? An answer may lie in a seemingly unrelated area of economics: wages and compensation. Consider the case of Arcnet, a telecom company in New Jersey. Arcnet leases a BMW 3 series for every employee, just as a perk for working there. Why does Arcnet do this? On its website, the firm says, "Even though this is a great place to work with fabulous benefits and great people, the car is a good reason those of us who work here don't have our resumes in circulation. How many of us are ever going to drive this car working for anyone else? The car goes above and beyond anything any employer will ever do for us. We know it and appreciate it." One employee is quoted as saying, "I feel like I won the lottery!" Now, the same logic applies to Arcnet's BMW offering as to holiday gifts. Suppose it costs $800 per month to lease a BMW 3 series and pay for the other goodies they throw in. Wouldn't Arcnet be able to retain even more workers if it just gave everyone an $800-per-month raise? Then they could lease the car if they wanted to, or get something else they liked better. Yet it's very possible that employees value a BMW more than they would value an additional $800 per month. Perhaps you'd find it awkward to tell your Depression-era parents that you'd bought a car costing twice as much as a Toyota Camry. Or you may worry that your neighbors would think you were putting on airs if you bought yourself a new BMW. Or perhaps you've wanted to make such a purchase but your spouse insists on remodeling the kitchen instead. In other words, you can get as a gift something that you couldn't justify buying for yourself, even though you would like to have it. Both Waldfogel and Frank concentrate on one-way gift giving: Arcnet's employees, after all, don't get Arcnet gifts in exchange for their BMWs. And indeed, if only one person is giving a gift, then cash may very well be king. But if gifts are being exchanged, then a host of new considerations come into play. Suppose we take Waldfogel's conclusion to heart. To do away with the feared deadweight loss of Christmas, everyone gets everyone cash. Does this make sense? In some cases, almost certainly not--consider the case of a husband and wife who write each other checks from their joint checking account. But more complex issues arise in less straightforward cases. Here are some that I've thought about. Can you think of others? 3. 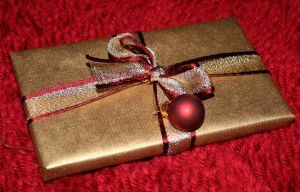 When non-cash gifts are given, they can be compared on multiple dimensions, making it difficult to say who gave a “more valuable” gift. One may be expensive but standard (jewelry); another might be very inexpensive but heartfelt (a framed kindergarten picture saying “World’s Best Dad”). But cash has only one dimension, making comparisons between gifts easy. Are the benefits of cash in terms of flexibility outweighed by the costs of awkward interpersonal comparisons? "So why do people give gifts"? Professor Greg Mankiw offers an answer based on Michael Spence's signalling theory. His main argument is that gift giving can be equated to a signal (generally of love), which explains why our girlfriends get offended with our very thought of giving them cash. Furthemore, as The Economist stated a few years ago, "some of the best gifts (...) are the unexpected items that you would never have thought of buying, but which turn out to be especially well picked". Certainly a world where everyone gives cash and does not need to spend several hours looking for the right gift would be preferable in a lot of ways; nonetheless I think too much would be lost, much of which can not be measured. There is another factor which you have ignored, which is the satisfaction (pure utility) that the giver derives from giving the gift. For the giver, they will give the gift if the utility they can derive from giving it is greater than or equal to the utility they would derive from the next best use of their resources. This utility could be linked to several different factors, depending on the personality of the giver. For me, the search to find the right present for the right person is a pleasurable challenge, giving cash would require me to forgo the satisfaction of this hunt.